Habitat: A waif on newly seeded ground. Plant Notes: According to Beckwith et al. 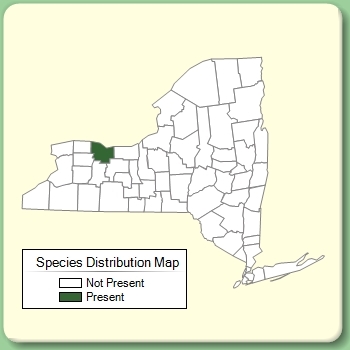 (1917), in 1909 at Highland Park and around Cobb's Hill Reservoir in Rochester, Monroe County grass seed was spread that had been contaminated with seeds of mostly western North American plants. Local botanists were instrumental in keeping these newly seeded areas from being mowed for a few years after which time the area was mowed on a regular basis. Collections were made of the species that appeared after the seeding. Seven years later in 1916 a majority of these introductions were reported to still be present (Beckwith et al. 1917). Many of these species are no longer persistent. Ericameria nauseosa var. oreophila was one of these introductions. It was reported in Beckwith et al. (1917) as Chrysothamnus pinifolius.